No matter what perils your adventure may hold, our Leather Sword Frog is just the thing for keeping your LARP weapon at your side and ready to fight. This sword holder is made of soft and sturdy leather with a front accent panel. The base of the frog and the belt loop are made of 5/6 ounce leather, while the sewn-on accent piece is 3/4 ounce leather. This LARP essential is available in a variety of color combinations and has steel fittings on the back. It easily holds most LARP swords, daggers, and axes in its tubular shape, and it can be worn on belts up to 3 inches wide. 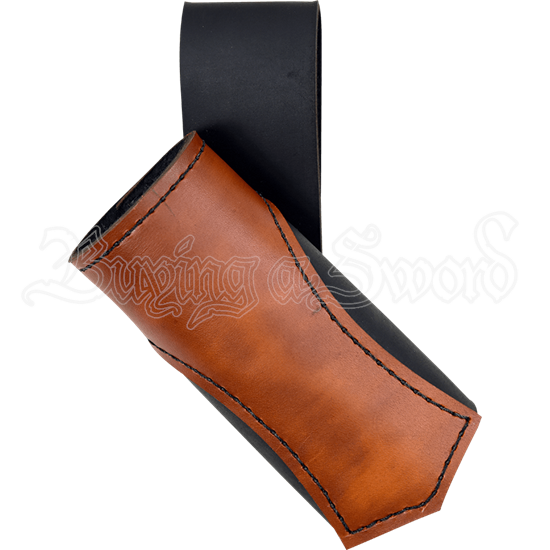 Be ready for your next LARP adventure with this leather sword holder at your side!